Beechey Bamboo in the garden San Marcos Growers has an extensive Bamboo collection. 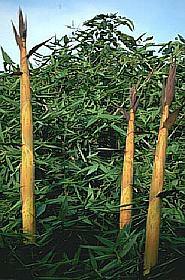 Many of the plants in the collection, such as our clump of Bambusa beecheyana, have been in the ground for many years. The newly emerging stems of the Beechey Bamboo are an apricot color. See this massive specimen, with culms 50 feet tall and 5 inches in diameter, in the San Marcos Growers Demonstration Garden. This plant was planted in the nursery production area in 1986. Several years later the nursery gardens were enlarged to include this plant within its borders. The large stature and arching habit give the illusion of a large canopied tree.